The venue is situated on a peninsula, surrounded by the Mississippi River and the Wolf River Harbor. 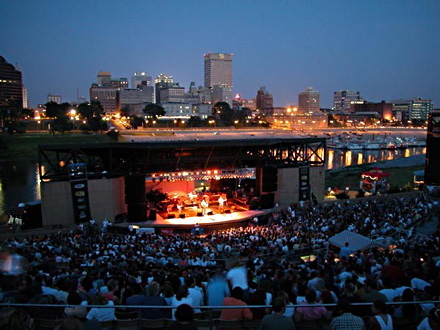 The Mud Island Amphitheater lies just beyond the Memphis City Skyline on the outskirts of the city. The Mud Island River Park, also located on the peninsula, contains the most accurate and impressive scaled down representation of the Mississippi River’s 954 mile course. Tickets and hours for the Park and Museum differ from those for the Amphitheater. If you are interested in accessing the park and museum prior to your event, make sure you allow plenty of time to get to the venue. 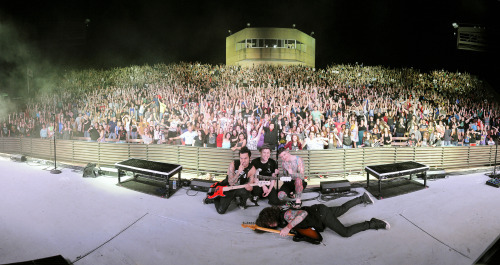 Due to its open air nature, events are only held at the Mud Island Amphitheater between June and October. Although the event list is limited, many great acts have performed there, including James Taylor, Journey, Beck, and Robert Plant. Rain happens! Please prepare accordingly, though remember: Umbrellas are not allowed in the event area. The theater takes 5,000 guests and offers three levels of seating, including a general admission area. All guests are welcomed to enjoy the delicious concessions available. Please refrain from bringing your own food and beverages. We ask that any guest purchasing alcohol be prepared to show a current government issued ID. The monorail carries guests from the harbor, across the Mississippi River, to Mud Island. The trip is 1/3 of a mile and offers expansive views of downtown Memphis, as well as the Park’s replica of the Mississippi River. The monorail trip is included in the price of your ticket, so please make sure you have your event ticket on your person at all times.